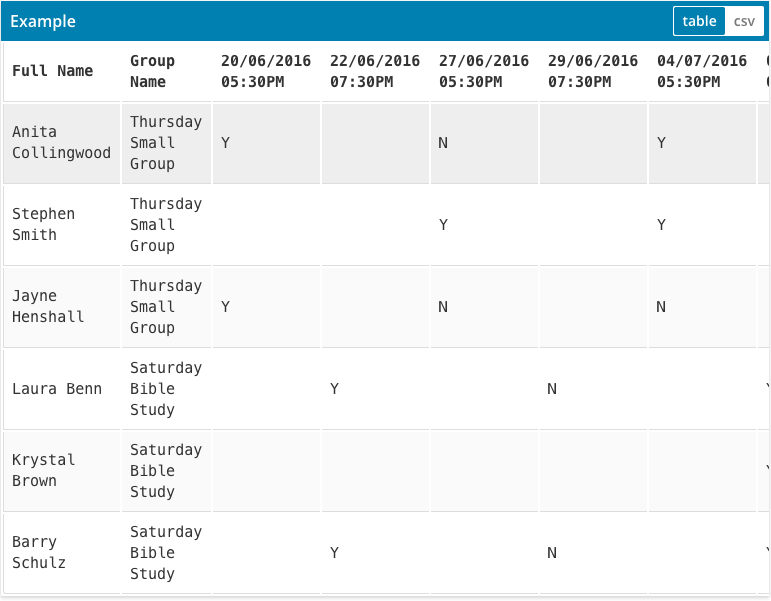 In Tithe.ly ChMS you can report on attendance to group meetings. Here’s how you can import your historical data. There are two ways your information can be formatted. There are two ways your information can be formatted. In both formats, the following values are used to indicate different things. If all members of a group are blank for a specific date/time, no meeting is recorded for that date. To perform the import, log into your Tithe.ly ChMS account and navigate to the Admin Area. Navigate to Groups → Import. Once the page has loaded, select the format of your file, and if you’re importing a single group select the group, upload your file and press the ‘Continue’ button to start the import. You can also choose to create new people or skip new people if any are found in the import file. Your import file will then upload to our server. Depending on the size of your import file and the speed of your internet connection, this may take some time. From here, follow the prompts to complete the process.